When you've got the Code, life in highsec is like a pleasant dream. If you stick to the Code, you can behold wonderful things and enjoy EVE. Without the Code, you're not going to have such a good time. Bot-aspirants find highsec to be a nightmare. And, as with a nightmare, the horrors carebears experience are those of their own making. The bot-aspirant is the author of his own misery, and he writes his tragic tale with the ink of his bad choices. Let's sample some of these from the week of December 6th @ 00:00 EVEtime through December 12th @ 23:59 EVEtime. Often, battles are won before the first shot is fired. So it was with Vade Arel, who was doomed from the moment he undocked. At first glance, he was triple-anti-tanked, but not exactly. His tank was analyzed by Agents BoneyTooth Thompkins ISK-Chip, Chris Costa, Inspector Implant, Trathen, Justin Kusion, Bob Painter, AIex Kommorov, Joel Kusion, Assassn Gallic, Jason Kusion, Fabulous Andy, Jake Kusion, Enri, Ganku Desu, Jayson Kusion, Ricki Lake Show, Turkey Baster, Jayden Kusion, and The O'Reilly Factor, who took him apart. That's right, Vade was triple-PLEX-tanked. In addition, he actually made a ransom payment of three billion isk plus a faction webifier worth another two billion isk. Still, he didn't see fit to purchase a New Order permit, so the payments merely added to his losses. You guessed it. All four PLEX dropped, so that's four more months of a ganker's subscription paid and four less of a bot-aspirant's. I'd take that trade any day and twice on Sundays. Let's take a step back for a moment and look at the bigger picture. 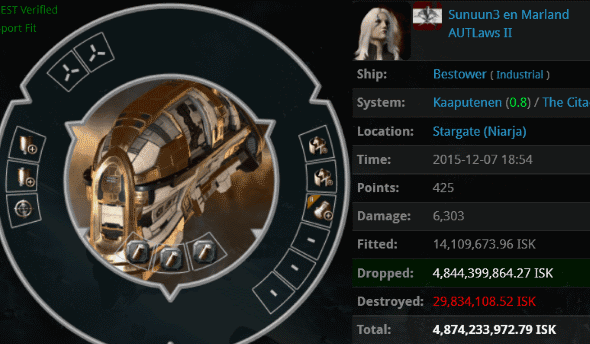 The worst part of Queue Arrestee's Tayra isn't the use of four anti-tank modules, or the laziness of the rest of his fit, or the 2.2 billion isk of cargo stuffed into such a flimsy hauler, or even the lack of a permit. The worst part is that we're not shocked by it anymore. We've seen so much madness from these carebears that, if we're not careful, we become numb to it. Instead, let's focus on the bravery and skill shown by Agents like Turbolaserwolf BurningStar. And let's not take that for granted, either. How AFK can a carebear get? Pretty AFK. Tixiera parked her bling piñata on a gate and went off to do whatever it is that carebears do. Agents Alyth Nerun and Ima Wreckyou saw to it that the Paladin was bumped 180km from the gate. It took three separate gank runs to destroy the beast. Remember, we're not dealing with hyperdunkers anymore. Tixiera was that AFK. 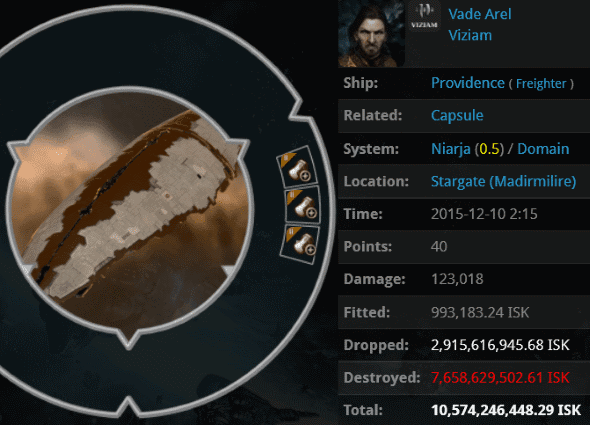 Fifteen minutes later, there was still no sign of activity, so they made one final run to pod her and add another half a billion isk to her bill. The best part is that her killboard shows that she's an Anti-Ganker. So why didn't Anti-Ganking save her during all that time? They were elsewhere--too busy nonstop failing daily, no doubt. Rebels threaten our Agents with the use of kill rights, but they're really only useful against the carebears themselves. Nennar took her freighter out for a spin, oblivious to the fact that a kill right was available for use against her. A distress signal went out, and the freighter was soon killed by Agents HotShotX Warcastle, Blacklabel21, Jaantrag, Sikir Jyto, and Concerned Citizen Sliven Halit. 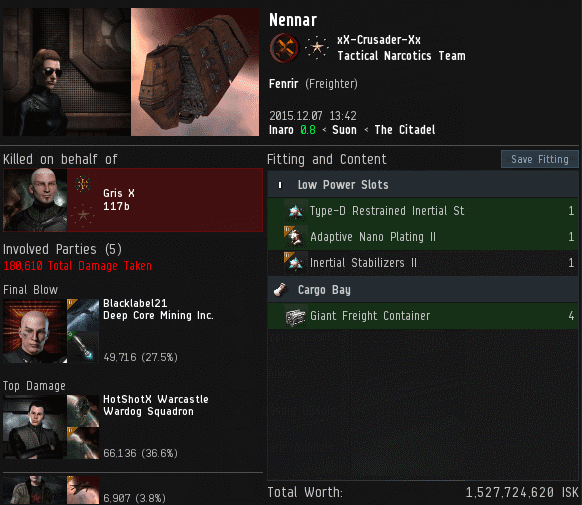 The kill right only cost 10 million isk. But this wasn't, at its inception, a New Order operation. Sliven Halit, who sent out the distress call, purchased the kill right, and tackled the freighter, doesn't believe in the Code. Sliven Halit > Don'T call me agent. Sliven Halit > I'm a regular thorn in the side of CODE when they show up somewhere. Sliven Halit > Just concerned citizen, without the notified local agents. ...Yet even Sliven knew that sometimes carebears go too far, so he enlisted the support of our Agents. Public opinion is moving in our direction. 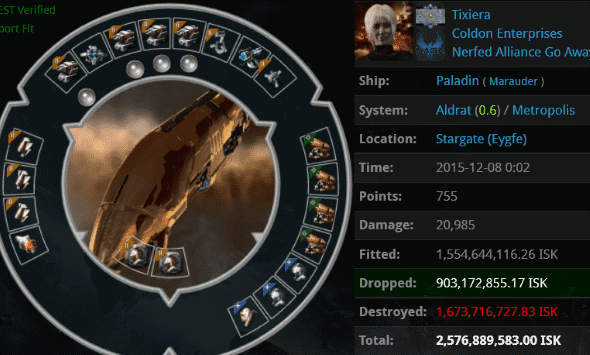 The kill-righted freighter wasn't the only reckless Fenrir seen this week. Suzanne Amatin's Fenrir accepted a duel(!) from Daredevil pilot Emma Painter; Aaaarrgg and Pod-Goo RepoWoman hopped on the kill. Suzanne's alt, Razor Blackcrow, was interviewed about the decision to accept a duel while in a freighter. Firnen Bakru > like golf? I think I know who this guy's golfing partner is. Firnen Bakru > a question: would you consider what just happend as pvp? Did he really learn from the experience, though? He still lacks a permit, so I doubt it. 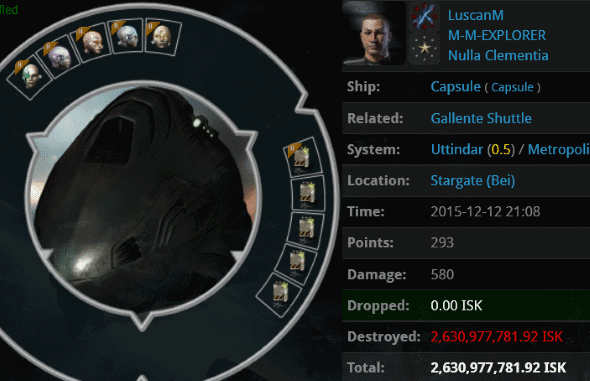 LuscanM provided our Pod of the Week with his 2.6 billion isk slave set, which he sent off into a shuttle while AFK. Agent Tisiphone Dira spotted the sleepwalker drifting through one of her favorite systems. Generally speaking, it's recommended that you not forcefully wake up a sleepwalker, but there's obviously a big exception to the rule: If they're about to do something harmful to themselves or others, wake 'em up! Tisiphone gasped when she saw LuscanM violating the Code, which is as serious as it gets. Thinking quickly, she splashed him with some antimatter and the crisis was averted. 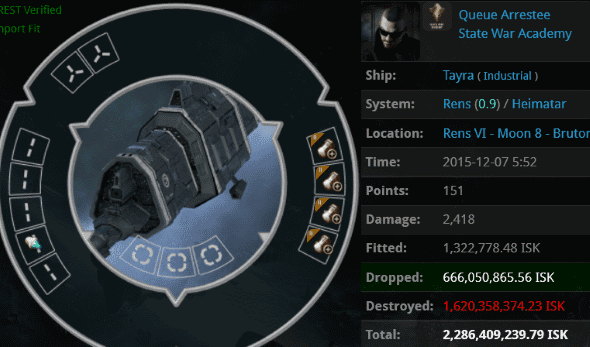 Carebears, don't become trapped in a highsec nightmare of your own making. You can free your mind. Waking up only costs 10 million isk per year and your obedience to the Code. Trust me, you'll sleep easier. That paladin lossmail was a disgrace to humanity. Congratulations to those who disposed of it. Eve salutes you! They are all bot-aspirants. Good work agents. Looks like the CODE is still winning non-stop daily repeatedly continuously! The anonbears are honoring the Sabbath. They see the mistakes of their bretheren and they are giving us a day of peace to reflect on it. TRUMP/JAMES315 2016 is the ticket of my dreams! !